Tilted Horizons: Aerostich Gear Xpander Wash! 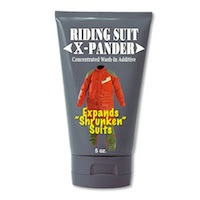 The 2010 Aerostich and RiderWearHouse catalog introduces Gear Xpander Wash, a new fabric treatment for the rider whose jacket, pants or riding suit has mysteriously become smaller over the winter. The concentrated wash-in formula works at a sub-molecular level to soften the internal fiber structure of textiles, providing an expansion of up to one full garment size. Garment strength and durability are not affected. After washing, riders immediately wear their damp gear for 20 minutes, which allows the fibers to re-conform where needed. Then the garment is machine-dried to 'set' the fabric at the newly expanded size. Treated suits should not be worn in rainy or damp conditions as the fibers will return to the original pre-expanded size, which can be a choking hazard. Gear Xpander Wash is $847 per 5 oz bottle.